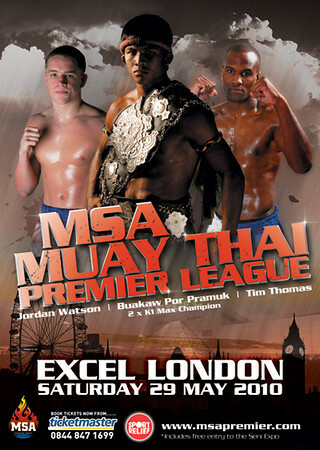 Just a reminder via Dan Green that Buakaw is due to make his first appearance in London, UK on may 29, 2010. The 2x K-1 MAX champion is set make his UK debut against Jordan Watson who has racked up a 29 win and 4 loss record. Jordan despite losing some teeth in his last effort at MEN Arena against Italy competitor Gianluca Buccolierio took the win in a very decisive performance. VIP table seats include a two course Thai meal and two bottles of champagne per full table. ~ by fatsoking on May 14, 2010.